We all want to be successful in our lives in all aspects. We want the perfect life partner, the best job, the happiest friendships, the nicest car, etc. It’s good to dream and to think of all the things we want to accomplish. But for many of us, these dreams don’t manifest into reality because of our unwillingness to try to make things happen. There can be any number of reasons why we don’t make good on our goals and promises. We might not feel confident enough, we might be scared of failure, we tend to get frustrated or bored at the offset, we might just not be motivated enough, etc. It’s well known that every person’s success begins with their attitude and mindset. If you’re driven and determined, there’s really nothing that you can’t accomplish. But to do that, you need to be in control of your mind. That’s a challenge many of us face. 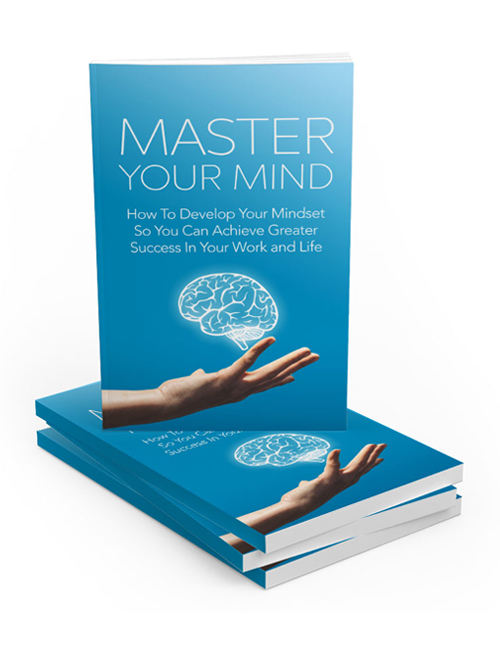 In this guide which also includes Master Your Mind videos, you will learn to understand yourself and your thinking. You’ll discover how to train your mind and steer it towards success, how to enhance your mental strength, understanding minimalism, knowing the Law of Attraction, using your creativity and imagination, how to look at failure as a motivational tool and get beyond it, how to manage your time, how to laser focus on your tasks, why you should put yourself first ahead of others and much more. It all begins and ends with what’s between your ears. When you can master that element, you are literally unstoppable. This guide is designed to help you see the whole world as your oyster and gear you towards making your mark through the one thing that you have complete control of; your mind. It all begins here so hit the download button now. Package includes a professional sales-letter and ready-to-go sales materials.